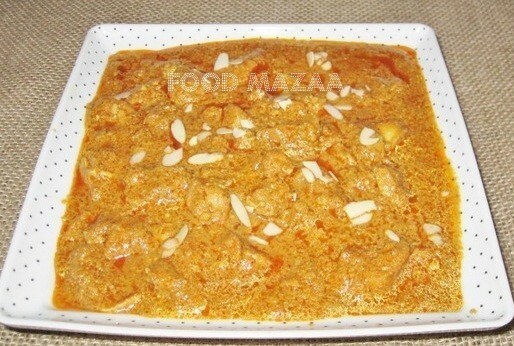 This is a traditional chicken cooked in rich and creamy gravy. Perfect dish to serve in a party. Slivered almonds .. for garnishing. 2. Marinate them with the ingredients mentioned in the marination list. 3. Meanwhile prepare the gravy. 4. Heat oil in a pan aaaaaand fry the onion to golden brown colour. 5. Add the ginger garlic and saute. Tip in the cashewnuts and half cup water. Simmer. 6. Grind this to a puree..
7. Heat oil in a pan and add the cinnamon, cardamom and bay leaves. Add the marinated chicken cubes and saute. Add the tomato puree and simmer to cook in its own water. 8. If needed you can add a little water to cook it until three-fourths done. 9. Now add the ground paste and the mentioned spice powders. Check the salt and add if needed. 10. Finally stir in the cream and give one boil. 11. garnish with almonds before serving. Looks very tasty! I love that creamy gravy. Rich looking droolworthy murgh pasanda..
gr8 murgh pasanda, so many things you guys have to do with just one chic, surprising, and well plated too !